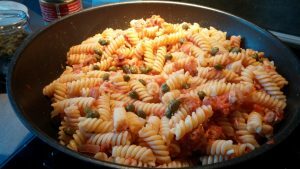 I love that mix of chunky tuna bits and sour capers swimming in tomatoes sauce, When served I sprinkle some grated Parmesan cheese. Process of preparing it is simple and suitable for beginners. 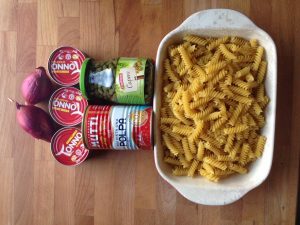 Pasta (Italian portions are 80 grams per person) I recommend you use all short shapes. Capers (3-4 table spoons) We like capers so I’m abundant with them. Parmesan cheese – grate it or scrape it in super thin slices and garnish the pasta. Put water in a big pot and bring to boil. I speed up with using electric kettle and then just pour into the pot. 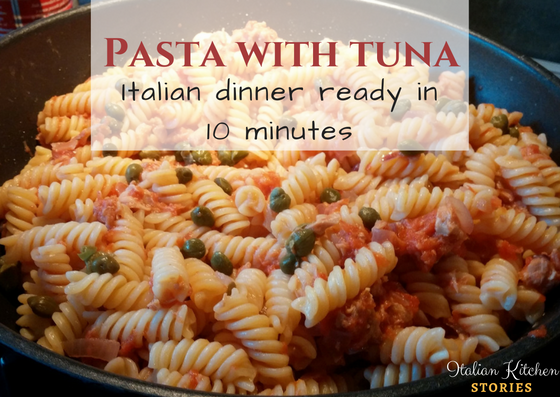 Once you add pasta you will have about 9-10 minutes to prepare the tuna sauce. Chop the shallots (or onions – both are great) into fine pieces. 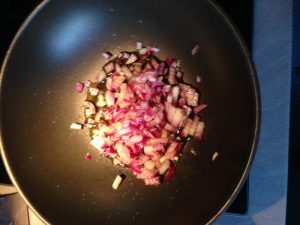 Take the frying pan (I like using the wok) and add olive oil and chopped onions. 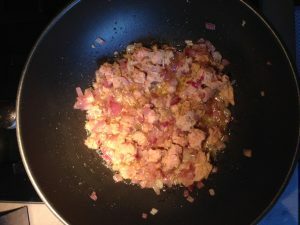 Once the onions have soften up add drained tuna and let it heat up evenly over the low heat. 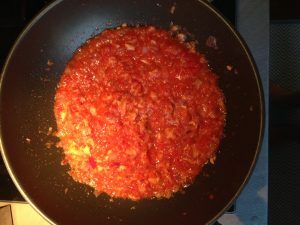 Add tomatoes chunks and stir all together. Give it a pinch of salt and a bit of fresh ground pepper. Occasionally stir the mix until all heats up evenly. 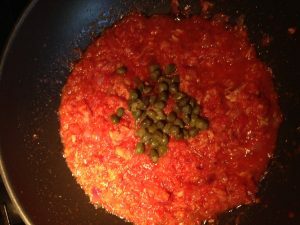 Add capers and taste the mix if you need to add extra salt or pepper. In case that your tomatoes are overly acid you can add a pinch of sugar to neutralize it. 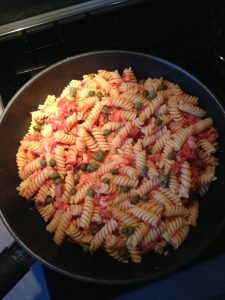 Add the pasta to the tuna and if you like add some grated Parmesan cheese before serving it. Always keep the water you cooked your pasta in. Sometimes can happen that sauce is not enough for the quantity of the pasta and it becomes a bit dry. In those cases Italians add a bit of cooking water to add moisture when needed. 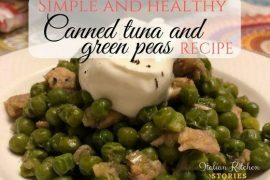 I hope you will enjoy this recipe and make it many times for a fast dinner fix.